There’s nothing quite like holding a steaming mug between your palms and letting the aroma awaken your senses. The warm mug heats up the heart line that runs across your palm, making drinking tea literally a heartwarming activity. Why do you think many cultures prefer handleless teacups? Any avid tea drinker knows that tea can be a great addition to any time of day, whether you enjoy a cup right as you roll out of bed or have an afternoon pick-me-up to make it through the rest of your workday. The British custom of starting off the morning with a cup of rich black tea is also often popular with people who are trying to cut back their coffee consumption for health reasons, like regulating cortisol levels and managing adrenal fatigue. Tea makes a great alternative to coffee, as tea generally has lower caffeine content than coffee. After many years of being a strictly coffee-only person, I became a tea drinker while spending a year in New Zealand. The piping hot, creamy morning cuppas won me over. Waking up with black tea will still give you a caffeine hit while also giving you lots of great flavor blends and various options to choose from, whether you prefer English breakfast, Earl Grey, masala chai, or something else entirely. As with any tea, be sure to check the suggested brewing time and water temperature to ensure you’re getting the best taste and overall tea-drinking experience. 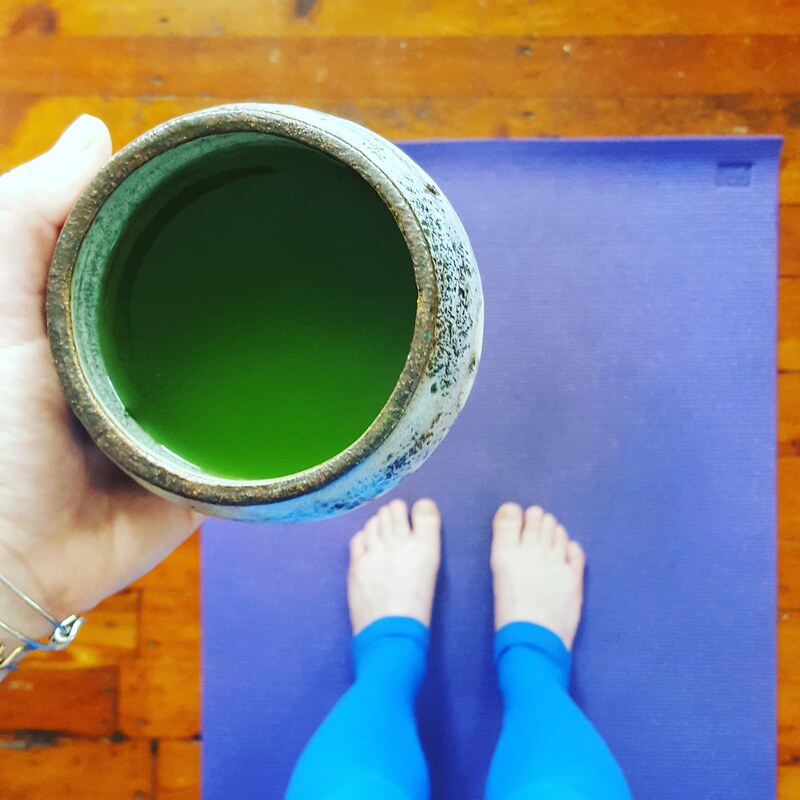 One of my favorite candidates for an afternoon pick-me-up is matcha. There are many different ways to consume matcha, which is a fine powder made from green tea leaves. Matcha is a very healthy tea because the entire leaf is consumed (rather than brewing and then discarding the leaves), therefore providing you with the benefits of all the nutrients contained in the leaf. Antioxidant-rich matcha also provides a longer-lasting and steadier, jitter-free high than coffee does, making it very helpful when you’re feeling tired, unfocused, or simply in need of a natural superfood boost. Matcha can be a bit of an acquired taste if you’re not used to it, but over time you’ll likely begin to crave the clean, earthy, rich taste it offers. The evening is a great time for herbal teas like peppermint, chamomile, nettle, rooibos, or hibiscus. 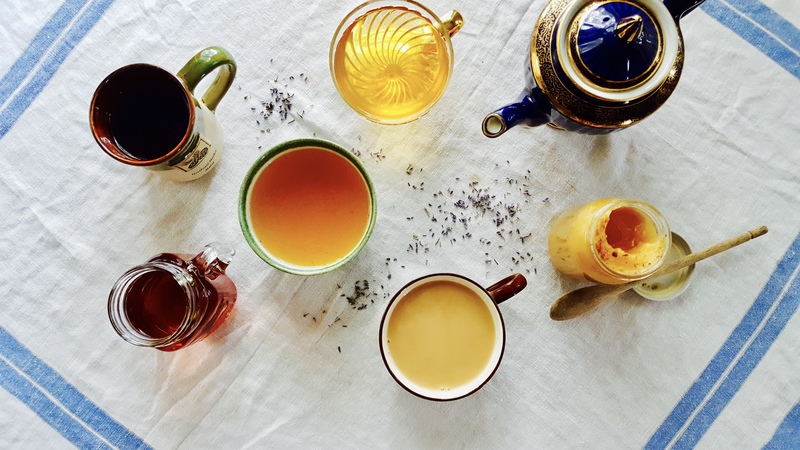 The many health benefits of herbal teas, from aiding in relaxation and decongestion to soothing nausea or a sore throat, make it a nighttime ritual for many people around the world. You can go a step further and try making your own herbal tea blend for evening time with dried herbs (order in bulk to be cost-effective). My favorite blend includes peppermint, roses, chamomile, and lemon verbena. Play around with different combinations until you find your ideal balance. Aromatic and light, white tea is another popular choice for mornings. Since it’s minimally processed, white tea is very fresh and delicate in taste. It packs about as much caffeine as green tea. Pu’erh is special because its leaves go through a fermentation process before being dried. This aids in digestion and offers a deep taste with no astringency. Try pu’erh after lunch or whenever you’ve had a big meal. While oolong tea still contains caffeine, it also has a relaxing effect, making it a good choice for early evening when you want to wind down. Take notice of how the caffeine in oolong affects you, though, before making it a staple of your evening routine. While tea culture is still overshadowed by coffee in America, tea is making a name for itself as a healthy drink that can calm you instead of keep you up at night, won’t stain your teeth like coffee does, and provides many health benefits in addition to great taste. What’s not to love?